I often get requests from preschool teachers for "book and tapes" - kits that include a picture book and an audio recording (a tape or, with newer recordings, a CD). Teachers tell me the kids love to listen to them because they include sound effects and music that really bring the stories to life. I must admit that, even though I order the audiobooks for my department, I haven't listened to a lot of the picture book audio recordings. This is something that's going to change. I love listening to audiobooks, but I do so most often in the car. As my commute to work is very short (typically about 15 minutes), that makes listening to a longer audiobook difficult because it stretches it out over weeks and it means I have to listen to it in 15-minute spurts. Checking out some picture book recordings is a great solution! Most of them are between 5 and 20 minutes long, making them perfect for short car trips. One caveat is that, obviously, you are meant to look at the artwork in picture books (which is tricky when you are driving... ;). That said, here are some recent picture book audio recordings I've been listening to (and look for more reviews like this in the future!). 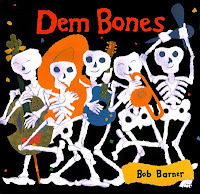 Dem Bones by Bob Barner. (Ages 4-7) Audio produced by Weston Woods, narrated by Chris Thomas King. The leg bone's connected to the knee bone in this book about the bones in the human body. Music accompanies the song "Dem Bones" and after singing about each connection, information is given about that bone. I found myself moving my body as I listened to the narrator tell me that without ankle bones I wouldn't be able to walk or dance and that the shoulder bones fit together so that you can move your arms. This would be a great contribution to a classroom lesson on the skeleton or the human body. The first two tracks provide the text with and without page signals. The third track is just the song "Dem Bones". Stars! Stars! Stars! by Bob Barner. (Ages 3-7) Audio produced by Weston Woods, narrated by Gavin Bozza. My favorite thing about this book is that it has a very simple rhyming text and more information about space and the planets is included at the end. This book makes a great readaloud for preschoolers but it contains enough additional information at the end to be useful to curious older kids as well. Majestic music accompanies the simple text and it made me feel like I was at the planetarium. One thing to be aware of is that this book includes Pluto as the ninth (and smallest) planet. It's a great recording and would work well for a space-themed storytime or a preschool class doing a space theme. 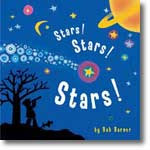 Bob Barner is a popular author of nonfiction for preschoolers. I've often had preschool teachers specifically request his books and I'm beginning to see why. He's able to combine a simple text with facts and information so you can adjust the story to fit your audience. I'll definitely be looking for more of his books! Make sure you check out his awesome website where you can get a glimpse inside his studio and watch video clips of some of his books! As you love audiobooks, let me take the liberty of pointing you in the direction of something new you may like to try. TableRappers - Persistent Spirit is the first ins a series of books set in the afterlife-obsessed society of Edwardian London. You can read some reviews here. I hope you get the opportunity to give it a listen, and of course hope you love it!